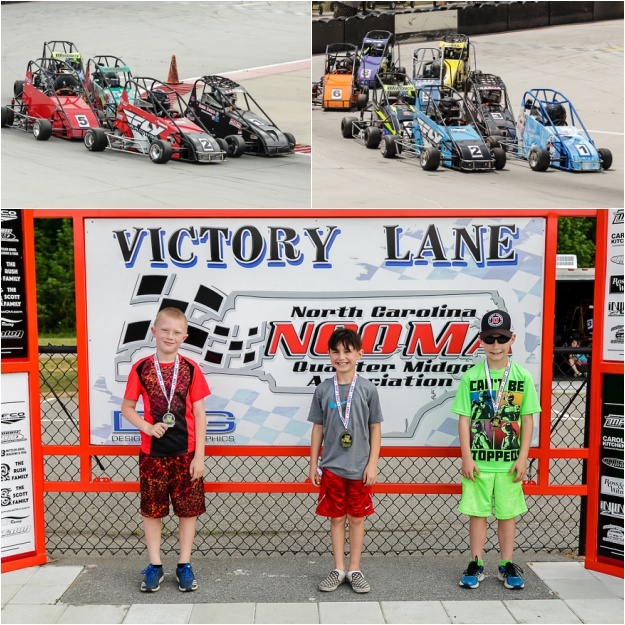 4/8 (NGQMA): This was our first Dixie Shootout regional race of the year. Dillon got fast time in Jr Animal. He qualified 6th in Jr Honda. Unfortunately, our results for the weekend weren't what we were hoping for. The dice roll was a 5, but with only 4 Jr Animals, the invert ended up putting us starting 4th instead of 5th. At the start of the race, Dillon looked fast, but his front oil cap came off and he began leaking oil. This meant that we weren't allowed to continue in the race, so that ended with a 4th. In Jr Honda, Dillon started 6th and was fast, but got sent to the back after being involved in a wreck. He was able to pass his way back up to 6th, but the laps ran out before he could do anymore. 4/1 (NCQMA): Dillon got fast time in Jr Honda. Qualified 3rd in Jr Animal. They inverted the top 2 qualifiers for the feature races. With the invert, Dillon started 2nd in the Jr Honda feature, but the #1 car had to come off the track during warm ups, so that moved him back to the pole. Another car was able to get around Dillon in the first few laps, but Dillon got a little too aggressive trying to get back to the front and ended up spinning him out. This sent Dillon to the back of the field. He was able to make his way back up to 5th, but ran out of time before he could get any further. In Jr Animal, he started 3rd and finished 2nd in a caution free race. 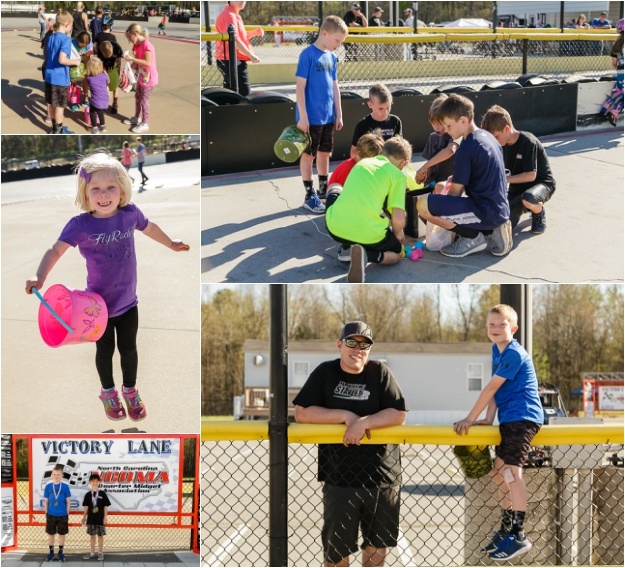 We also had our track Easter egg hunt which was lots of fun for all the kids! 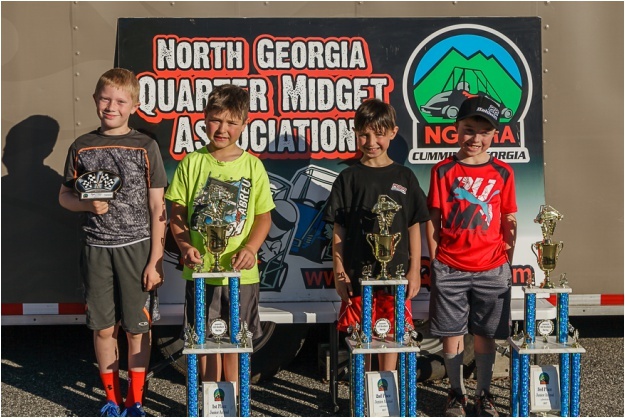 4/29 (NCQMA): Dillon qualified 2nd in both Jr Honda and Jr Animal. In Jr Honda, Dillon started 2nd, but his tail cone came off on the first lap when he got together with another car. Unfortunately, this meant he had to come off the track and restart in the back. He managed to make his way back up to 5th in a race that went caution free after that. In Jr Animal, Dillon started 2nd but had his chain come off just a few laps in. He had to come off the track for repairs and then restart at the back. He raced his way back up to 2nd but didn't have enough laps to catch the leader.